The Royal Palace is one of the most important parts of the Prague Castle complex, and its Gothic appearance contrasts with the eighteenth-century architecture of the buildings adjacent to it. The Royal Palace was originally the Prince’s Palace, becoming the Royal Palace in the thirteenth century. It then was the residence of sovereigns and retained this role until the Habsburgs moved their residence to the western part of the Castle at the end of the sixteenth century. From then on, the Old Palace was used mainly as offices and for storage. Cellars and part of the ground floor of the palace of Soběslav I, dating from the twelfth century, survive under the Vladislav Hall, and the Princes Palaces, built partly of timber, were also located there. 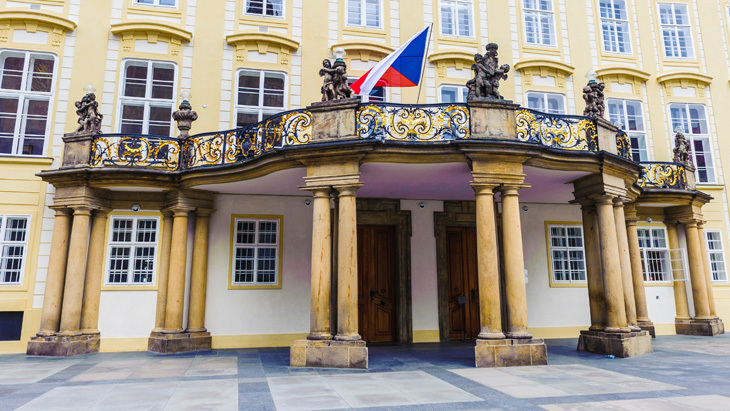 Later on, the residences of rulers Přemysl Otakar II, Charles IV and Václav IV, whose chambers survive on the lower floors of today’s Royal Palace, were added to Soběslav‘s palace. Vladislav Jagiello, King of Bohemia, added a new storey to the Royal palace through enlargement and reconstruction, at the end of the fifteenth century. The core of his work is the large chamber named after him, the Vladislav Hall. Access to the palace is from the Third Courtyard, and close by is the Baroque Eagle Fountain of 1664. From the antechamber visitors pass turn left into the Green Chamber, a courtroom during the reign of Emperor Charles IV. Adjacent to this room is a chamber known as the Vladislav Bedchamber, and the Office of the Land Rolls.